A: Administrative Assistant for an investment banking firm. I'd rather being training or training people then sitting behind a desk in a corporate environment. A: I ran Track & Field from age 9 to 15. Then decided to run a corporate challenge 3 1/2 mile race in Central Park in 1996. I seriously started running in 2001. 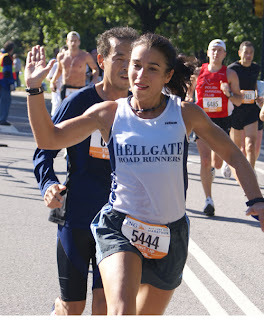 My first official long distance race was the Long Island Half Marathon. A: I absolutely love it and how it makes me feel. Plus it helped in the losing weight factor too. A: Well I workout mornings doing biking and lifting. I keep my running for the evenings. Doesn't matter which order but I need to put in 2 workouts a day to feel satisfied. A: Well right now zero since I'm injured. On my normal running schedule 25 to 30 miles - give or take. Q: You are a multisport athlete. How did you become interested in triathlons? Q: What is your favorite event: Swimming, biking or running? A: I find swimming puts me in a nice zone and it feels peaceful. Biking let's just say I'm trying to get better. Running is my main root where I say let's get this party started now! Q: What is your least favorite workout? A: If I have to choose one, I would have to say the speed workout. It's a love/hate relationship. Q: What is the longest bike ride you've ever done? How far did you go and how long did it take? A: 85 miles - 8 1/5 hours (getting lost). We started 7:00am and finished at 4:30pm. I did a Century bike tour last summer with Joel & Tony. Tony and I stayed together (thank god). It was a beautiful morning and very scenic. Everything is going great with following the directions until Tony said "I think we did this loop." I looked up and said "yeah we did". With confusion, I said "how did we get lost?" Tony was baffled as much as I was. We called the bike club from the sheet they gave us and asked how we can get back on track. They suggested to do the loop again. Tony said "screw that." I agreed with a little more to the tongue (LOL). So needless to say, we came across this nice lady who helped us with directions. We said thank you and continued on our way. Then we were really even further lost the 2nd time when we came upon the same lady. Now how ironic is that? We finally decided to follow her in hopes that we would find our way back somehow. In the meantime, my cell phone continuously rings with Joel calling and other friends calling "Where the hell are you?" Well if we knew, we wouldn't be lost. We FINALLY found our way and met up with the people who were waiting for us. Joel was long gone. At that point I had on my odometer at 70+ miles and we weren't nearly done...ugh!!!!. The plan was to do the 70 mile route but with getting lost it added mileage. As we finally approached the parking lot and there were only a few cars remaining. The lot was packed at 7am. I got off the bike with agony, grabbed my free ice cream cone coupon and made my way to the Mister Softee truck for my favorite treat - a vanilla ice cream cone with chocolate sprinkles. My reward after a long and tiresome day. It doesn't get better than that!!! Q: How bad were you hurting? Did you workout the next day? A: My legs were sore as anything so I decided to swim 2 miles. That's what great about cross training!! Q: On the morning before a big race what do you usually eat? A: Either oatmeal with slice banana and soy milk or Kashi whole grain cereal with wheat germ and soy milk. I may drink a small glass of orange juice to down my vitamins and supplements. A: I devote 20 minutes to stretching. Also I spend some time visualizing my race strategy and keep a positive approach. Then I set in the my competitive drive. A: Team Hoyt. I have tears when I think of their passion and a father who would do anything for his son. That's what it's all about - - DETERMINATION. My idol (don't laugh) is Madonna. In 1992 I was at her concert and was in awe with her physique. I wanted arms like her... well I think I accomplished that (LOL). A: After my workout, I run the shower and dump my running gear on the bottom. They get a washing while I do. I rinse them out and line dry in the bathroom. A: "Looking forward to" may not be the phrase to use but I need to do NYC Marathon since last year was not a great experience. Also Tupper Lake, I want to not walk during my run to see how much time I can shave off. The past 2 years were the same finish times. A: I would love to do a Ironman but I need to mentally prepare myself for that. I'm happy doing any type of race because it means I'm out there doing what I love. Most importantly it means I'm not injured (LOL). A: The whole experience of the Chicago Marathon. Not only was it a PR for me but to run side by side with Suzanne and Yvonne was something I could never imagine. It's one thing to train and put all those miles in together but on race day you are basically on your own. Well I thought wrong and we ran together until mile 20. It helped tremendously on any struggles and negativity. I didn't think of those thoughts because I had such a huge distraction and we worked together as a team!!! It was truly amazing and by far the most memorable marathon. I believe any marathon experience I encounter could never compare. Also I couldn't ask for a better weekend as far as going to the expo, dinner with the whole gang the night before and sharing the post marathon experience together. Well our flight home was not pleasurable but you can't have everything. Running from one gate to another gate to missing the flight really was painful after completing my best marathon ever. If you ask me you've got Madonna beat in the arm department and although she can probably sing slightly better than you, my money would be on you in a road race or Tri!!! We all know Janine can cut a rug... I'd like to see a Dance Off! Well Josh let's just say you missed my performance at Mike & Maritza's wedding in PR. Right Suzy?